As SMITE continues to grow almost on a weekly basis, Hi-Rez pushes to expand their market reach into other regions of the world such as Asia. 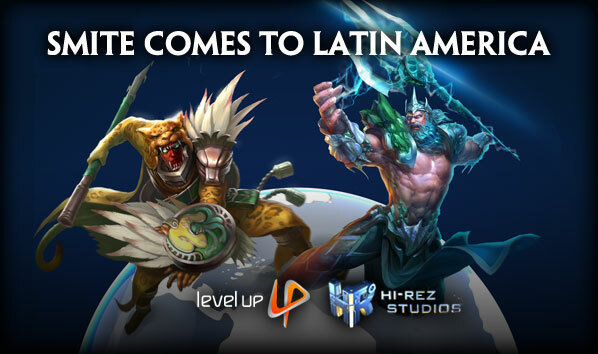 Similar to their partnership with Tencent August of last year, Hi-Rez announced last week that they will partner up with the Brazilian publishing company, Level Up Gaming, to bring SMITE to Latin America. As it stands, several players, notably those affected in South America, have shown their lack in trust in the Philippine publishing firm from prior experiences during Perfect World’s tour. What’s the biggest concern? Cash shop and pay to win (P2W) implementations. Followed by that is server security and stability; which is a extremely reasonable concern for any player. Since 2008, Level up publishes here on Brazil a game called Perfect World. Some people here might know this game. on the same year (few moths before its release), a massive bug happened. … As long as I can tell, this only happened on our servers. This bug was nothing more than the dissapearing of all collectible items (like herbs, wood, mines, that kind of things- they were using for forging weapons/armor, for the pharmacy skill and even to create items to “unlock” dungeons). Outside players might think that this isnt a big deal. But there are some vital quests known as “Spiritual Cultivation” (which allow you to unlock new skills to learn) that required those collectible items that had suddenly vanished. Every single collectible item were gone. And people had no clue why those things suddenly dissapeared – On the international servers, nobody had this problem. The strange part? The items that were used for crafting were being sold on cash shop. Now, SMITE doesn’t have any in-game mechanics that could be taken to be sold via a cash shop – but things could always change or be added depending on the exact details of the business agreement between Hi-Rez and Level Up. 1 – What benefits will I receive for playing on this new server? Better connection or PING while playing games. Tournaments and exclusive events for the region. More payment facilities and the option to do transactions in commercial establishments. Chance to participate in the qualifying rounds of the ‘SMITE WORLD CHAMPIONSHIP’ to represent Latin America in the tournament to be held in Atlanta in early 2015. 2 – Will the game be fully adapted to Spanish? The whole game will be translated into Spanish with the review and endorsement of HI-REZ. This process is very important because we want to offer all players a highly qualified Hispanic translation so that they can live a unique gameplay experience. Right now we are recording the voices of the gods that will bring all the emblematic phrases specific to them. 3 – What will the dynamics of the ‘SMITE WORLD CHAMPIONSHIP be? One of our main objectives with SMITE is to bet on growth of ‘E-SPORTS’ in the region. That’s why at the end of this year, we will be performing the qualifying rounds to set the group that will represent us in the great ‘SMITE WORLD CHAMPIONSHIP. This event will bring together the best teams in North America, Europe, Asia, and Latin America in order to find the great world champion. 4 – How will the buying system be on the new version of SMITE? Do I have to pay to play? Like the international version, the god purchase system, including voice packs and everything else, will be based on the policies that HI-REZ is currently using; there will [not] be changes of any kind. Like all the games of Level Up library, SMITE does not have a ‘PAY TO WIN’ system, you >will be able to freely download and the purchase of gems will not affect the aftermath of competition. 5 – Can I continue to play on the North American server? We are discussing this possibility with Hi-Rez at the time. For now, as we have been saying, we want to consolidate a Hispanic community >that can enjoy the game in Spanish with all the advantages offered by Level Up, in addition to compete in high level tournaments that will be >designed especially for the region. Those of you in Latin America, how do you currently feel about this? Are you not worried, or does the ambiguity of Public Relation responses do nothing to help your anxiety? This is a guest written article by Sephalon. Being fucked by one of your own turds, how does that sound?